Where can you get the expertise of factory-trained window professionals who take precise measurements to ensure a weathertight seal? Where can you get an affordable, attractive, energy efficient solution for your home heating and cooling bills? Renewal by Andersen® of Montana is your top choice. We are happy to provide comprehensive window replacement services for our neighbors in Bozeman MT. This is one of our favorite places to work in — the fourth largest city in the state, county seat of Gallatin County and home to 43,000 hard working people. Bozeman is a community on the move, and we want to be a part of that journey. Our window contractors would be happy to visit your home and show you just how much you can save on energy bills and increase your curb appeal with the right windows. We’re pleased to note that our replacement windows and doors are protected by one of the strongest warranties you will ever find*. In addition to that, Renewal by Andersen’s High Performance™ Low-E4® SmartSun™ glass is 70% more energy efficient in summer and 45% more energy efficient in winter as compared to ordinary dual panel glass**. Our exclusive Fibrex® frame material ensures you never have to paint again, plus they won’t ever corrode, pit or peel like wood or vinyl will. From casement windows to patio doors, we have the products that can help you achieve the look and comfort level you’ve been striving for. Consult with our design team to help you create a workable solution that meets your budget and style needs. Renewal by Andersen of Montana is your local source for superior windows and doors. To start your project, why not give us a call for a free, no-obligation estimate? Schedule your consultation at (406) 259-3944. We are located at 619 Daniel St Billings, MT 59101. 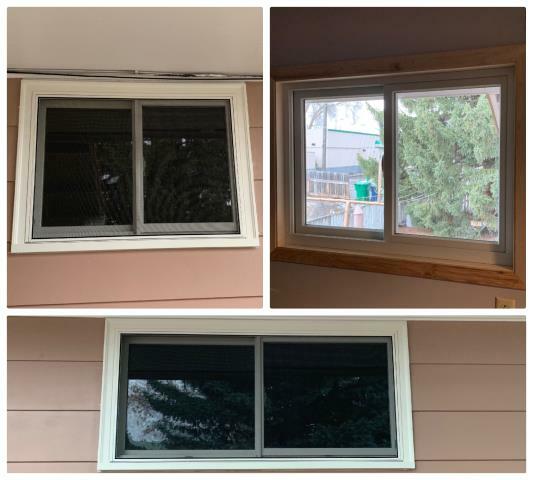 Full frame window installation in Bozeman. Our professional installers replaced old wood brick mold windows with new Renewal by Andersen Fibrex windows.